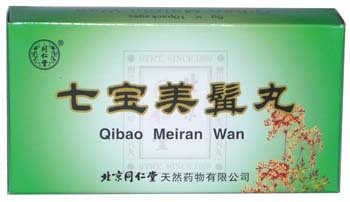 Qi Bao Mei Ran Wan or Qibao Meiran Wan is used for early whiting of beard and hair, odontoseisis, seminal emission in dream, spontaneous seminal emission, and feebleness of waist and knees due to the insufficiency of the liver and kidney. Action in terms of TCM. Nourishes the Blood of the Liver. 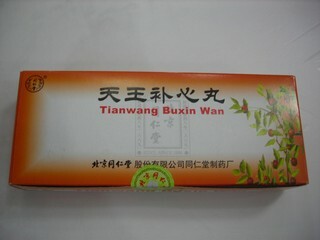 Nourishes Yin Kidney and Essence of Kidneys. Alopecia, early gray hair, thinning of hair, night sweats, general weakness, weakness in the lower back, abundant light vaginal discharge in women, spermatorrhea in men, muscle flabbiness, bone fragility, loose teeth, weakness of the lower back and knees. The tongue is pale, the pulse is weak. Anti-anemic, restorative, hypocholesterolemic, anti-inflammatory, regulating metabolism. Clinical indications. Alopecia, dysuria, impotence, male infertility, osteoporosis, back pain. Dosage: Take one pill (6g) at a time, 2 times a day.